I have apples and I can mix this batter by hand. That’s all the convincing I need. 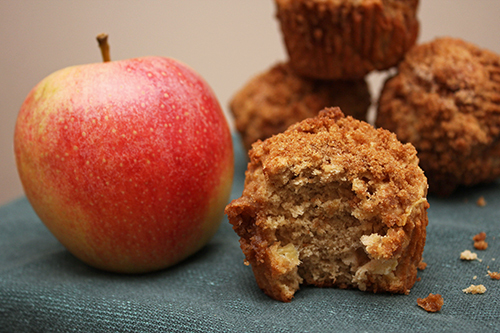 The “Apple-Cinnamon Crumble Muffins,” from The Baker Chick, require two apples and a short list of typical muffin ingredients, like flour, butter, sugar, eggs. I chopped one apple (by hand) and “grated” the other in my food processor. These 12 muffins rise high when baked, thanks to their crumb crowns. Moist, appley, and perfectly sweet, it’s a good morning. Next week, I’ll showcase my first recipe from the latest Ottolenghi Simple cookbook by Yotam Ottolenghi. I’ll make the “Chilled Cucumber, Cauliflower, and Ginger Soup” (which he first published in The Guardian in July 2015).